Apple released the Firmware 3.1 for iPhone and iPod touch to change the UI and also lock the phone if it was unlocked. Now, the iPhone dev team has released the Pwnagetool 3.1 for mac which can jailbreak the iPhone 3G phone running on 3.1 firmware so that you can install apps that are not accepted officially by Apple. Open Pwnagetool 3.1 and then select the device as iPhone 3G and the firmware file location. Go with the further steps which will carry out the entire jailbreak process. By the following above steps, you jailbroke the iPhone 3G and upgraded it to 3.1 firmware, still the baseband is protected, which we wanted. > This tutorial is strictly for IPHONE 3G and no other device like iPhone 3GS etc. so don’t experiment using any other model of the phone other than 3G. > Check this tutorial to Unlock iPhone 3G 3.0 firmware using redsn0w and ultrasn0w, if you are still searching to unlock 3.0 firmware device. > Don’t keep on trying and end up locking your phone permanently, please comment with any questions so that either me or some other reader can help you out. When you install Ultrasn0w and reboot your iPhone, insert the SIM card and then go on with the reset of network settings. It will work then. I installed ultrasn0w and everything, but when I introduce the T-Mobile sim card the iphone 3g is stuck in “Searching…”. I resetted the cellular settings and everything but istill no luck… any help? please write big and fat in the headline that this is not for 3GS. I just updated my 3GS to 3.1 and then I read in the notes that this fix is not good for 3GS. So now I cant use my Iphone anymore! I don’t understand the last 2 steps. I did everything according to the instructions. But after restoring it, it says “the sim card inserted does not seem to be supported…”. Wouldn’t restoring it put it back to original factory settings? That is what it says before I click on restoring it for the last step- “Now after the IPSW building process is done, you need to restore the firmware which you download by holding down the option key(in your mac, this is a tutorial for mac users!)”. Please help. Got it to jailbreak to 3.1. But couldn’t unlock it with 3.1 firmware. Has anyone successfully done it? i have a 3G currently running 3.0. I downloaded the NES app from Cydia the other day, and the app wasn’t working, so I went into Cydia to remove the app, and now ALL of my original iPhone apps/icons are gone – maps, settings, text, camera, photos, calendar, calculator, safari, phone, email, iPod, app store, you tube, stocks, weather, and the jailbreak apps for 3.0 (cydia & icy)…do not appear! to fix this i want to restore my phone with Itunes, but itunes says it will automatically install 3.1. IF I APPLY THE 3.1 FIRMWARE W/ ITUNES, can i still unlock with the steps you listed above? Unable to load networks list !!!! Now WHAT??? Use our phone as an itouch???? WTF? Then i did he stupid thing to upgrade with pwnage 3.4.1 to 3.1 os and from then i cant do anything. It says unable to load network list, i have installed ultrasn0w ofcourse but it cannot operate. Its an Itouch now ?? I’m having the same problem as rael. It may not work first time keep on doing it may take several attempt. If it get stuck some where hold the power botton & power bottom until it reboot & do the gailbreak again. 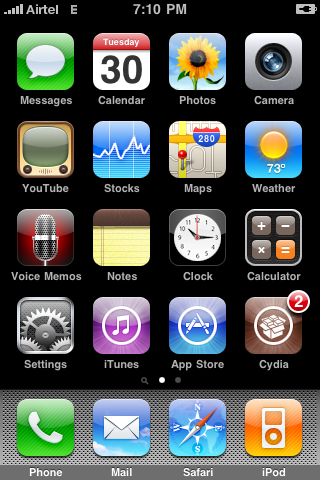 Yeah so I used blackra1n to jailbreak my iPhone 3G with 3.1. Jailbreaking went fine but when I tried to unlock with ultasn0w and reset my network settings, turn on airplane mode, then turn it off I am still “Unable to load network list”. Where the connection bars are supposed to be it just says “No Service”. My T-Mobile SIM has been inserted the whole time, what should I do?